A few months ago, JessTrev linked to a post involving some sort of Iron Chef competition. Initially, I was more intrigued by the entry - Rhubarb Pop Tarts with Coriander Ice Cream - than I was by the competition. Slowly, though, I got sucked in to Foodie Fights. I sat on the edge of my seat, shuttling home baked goods into my mouth as bloggers with names like Burning Pasta, Danger Kitten Bakes and Cranky Cakes whipped up delicacies crafted from two chosen but fairly random ingredients. Things like melon and pepper flakes or cauliflower and raspberry. I wanted in on the action! Kind of. And so I signed up. And I was actually chosen! And it was all good. Except it wasn't. I'm not really a foodie blogger. I'm just a green blogger who plants some pumpkins in her front yard, who shops the farmers market, who tries to make things from scratch, who preserves her food and eats seasonally. Hey, wait a minute!! Maybe I am a foodie - or close enough to fake it. And, now, it was all good. Secure in my place as an official Foodie Fight contestant, I checked my two required ingredients. Basil! My front yard runneth over with the stuff. This couldn't be more local or more green. It was all good. Pineapple. Uh, not so local. I squirmed in my chair. Pineapple?! We never ever buy pineapple and I don't even eat it. Pineapple?!? Don't they know I'm a green blogger. A locavore. Ah, that's right. Seeing as how I, like my blog mates, have left my eco-nazi days behind me, I decide, for this competition, to embrace the 2,388 mile fruit and all that if offers. It was all good. I spent the next several days scouring my cookbook shelf and the Internet. Looking for recipes that included basil and pineapple. Looking for recipes with basil OR pineapple. Pestering my friends on Facebook. Tweeting with my tweeps on Twitter. Annoying my IRL friends and driving my husband basil. Should it be a fancy cocktail? Some sort of custard or gelee? Perhaps a granita or a creme? (Don't I sound terribly, well, "foodie"?) I lost sleep. I lost friends. I lost sanity. But it was all good. Because I decided on the perfect dish! Basil cheesecake with pineapple cookie crust. Doesn't that sound all good? Except that it wasn't. In addition to burning the cheesecake (ahem, not very foodie of me), it didn't taste all good. Or good at all. Well, the cheesecake didn't. The pineapple butter cookies? Oh, those were ALL good. Light. Vaguely tropical. Just sweet enough. I mean so good that I had to fend Mr. Green Bean and the Bean boys off with a bamboo spoon to keep some for the next dish. So, pineapple butter cookie in hand (hey, a girl's gotta eat! ), I went back to the drawing board. Last summer, at a green moms get-together, a friend brought basil ice cream. Ice cream had actually been my first thought when I saw the ingredients but I felt that basil ice cream would be too predictable. Sometimes, though, predictable is also delicious so I dove back in - local organic whipping cream, pastured egg yolks and all. I gathered my ingredients, relieved the front yard basil of a few more leaves, tossed in a dash of cinnamon (per blogger friend, Crunchy Chicken's expert advice) and I was feeling all good. Maybe a little too good because I didn't pay attention and the milk overflowed the pan. But still, after a rag and some vinegar for clean up, it was all good. I chilled - the custard, not me, - and then filled my borrowed ice cream maker with pale green goodness and away we went. Thirty minutes later, some family and friends reveled in basil cinnamon ice cream taste accompanied by pineapple butter cookie. Say it with me, kids: IT WAS ALL GOOD. Utterly unique, refreshing, and absolutely delicious. All good. 1) Beat butter, with electric mixer, on medium until smooth. Blend in butter and cream. Add egg and pineapple juice and mix until blended. 2) Add flour, baking powder, salt and cinnamon gradually, while beating on low. 3) Shape dough into two logs and roll in yellow sugar. Wrap in waxed paper and refrigerate for two or more hours. 4) Cut chilled logs into 1/4 inch thick slices and place on greased cookie sheets. Put in preheated oven (350 degrees) and bake for 15 minutes. These can keep for up to a week or two in an airtight container - but they'll last that long only if you and everyone else forget they're in there! 1) Heat 1/2 cup milk in a heavy saucepan over low heat until bubbly. Add basil leaves and cinnamon, remove from heat and let stand for 20 minutes. Process in food processor until smooth, then strain mixture. Set aside. 2) Heat remaining 1/2 cup milk, whipping cream, and 1/4 cup sugar in a saucepan over medium heat, stirring often, until just bubbly (though, if it bubbles over, it still tastes fine!). Remove from heat. 3) Beat, by hand, egg yolks and remaining 1/4 cup sugar until thick and pale. Gradually stir in a quarter of the heated milk mixture into the yolks and then, stirring constantly, add yolk mixture to hot mixture. Now add basil mixture and cook, over medium heat, stirring continually for 6 minutes or until mixture coats a spoon. Cover and chill for 4 hours. 4) Pour mixture into an ice cream maker and follow maker's instructions. Please check out the competition over at Foodie Fights and then vote for your favorite dish - hopefully mine! I am sooo trying these! It looks absolutely amazing and I bet it tasted amazing as well. great entry! this sounds delicious! I boil the milk over without fail EVERY TIME I make ice cream. LOL--when I did the coconut ice cream to accompany my chocolate zucchini cake for the last foodie fights challenge, I also let it boil it over (hence, no pics of ice cream). Awesome. It looks great! It's nearly impossible to find actual Cinnamon Basil, unless you are already growing it out back. That looks so good! 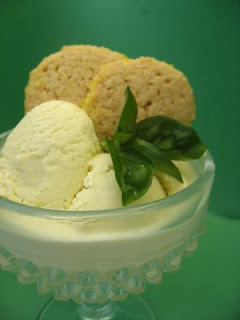 I've heard of basil ice cream before but haven't tried making it yet. I will have to now :-) And I've let the ice cream boil over too - oops! Erin: We still do non-local bananas sometimes and, at our farmers market, there are sometimes semi local (200-300 mile) mini bananas and mangoes. I buy those but, living in CA and having such a great fruit selection, we really don't miss the tropical fruit. lk: Thank goodness I'm not the only one. I felt, as I said, very "un-foodie" but maybe boiling over the milk is very foodie. downsized: Yay! More good company for the boiling over. Loved your entry last time. Crunch: Indeed! I'll need to look for some and also I want to try planting some chocolate mint (the plant) after tasting some up in your neck of the woods. Now that would make a good ice cream! Kristin: Woohoo for boiling over! It all works out, right? Hope you like the ice cream. It's awesome. I really wanted to make basil ice cream, I had The Perfect Scoop opened to the recipe and everything. However when I make ice cream that isn't kid friendly it is usually because I add alcohol. Those cookies look amazing. That looks wonderful! I'll have to try that basil ice cream when my garden is overflowing with it. so it would be acceptable, yet difficult, to make ice cream without an ice cream maker??? loved the post and your site! found you on foodiefights and very interested to read more about your green/local food living! Robin: What? The kids don't like alcohol?!? ;-) Can you send your farmer over later so I can alleviate some guilt. Loved the salad. Abbie: Indeed. This competition was the kick in the pants I needed to think of ways to use my herbs. BH: Can you borrow one from a friend? That's what I did. Makes it much easier. If not, you could try an ice instead of ice cream a la this post. It would probably be more sorbet-ish but still delish. Amanda: Welcome! Delighted you've dropped by. :) Please take a look around. Our older posts are divided by category on the lower right hand sidebar if you've got a particular area of interest or just hang out and join in the conversation. Thanks for popping in. Good for you for jumping into the contest! I have to confess that I would never have thought of making basil ice cream -- I'm still trying to imagine what that would taste like. I've never boiled the milk over when making ice cream because I've never boiled the milk. Is that because I've only made fruit & candy flavored ice cream, or is there another reason to boil it? Thanks Donna! No, you are not supposed to boil the milk at all. Get it to just bubbling. Oops! !